Andrew Finch was shot at his front door on 28 December in Wichita, Kansas. Police surrounded the home after receiving a hoax emergency call from a man claiming to have shot dead his father and taken his family hostage. The call stemmed from a row between two gamers playing Call of Duty online, US media say, although the address raided was apparently unconnected to either. Police have said they believe the report was an act of "swatting" where a person makes a false report to send police to another person or fake address. Audio of the emergency call has been made public. A man can be heard telling authorities that he had shot his father in the head, and claimed to have taken his mother and siblings hostage. The caller also said he had a handgun and had poured fuel over the house and wanted to set the property on fire. Police say they surrounded the address the caller had given, and were preparing to make contact with the suspect reportedly inside when Mr Finch came to the door. 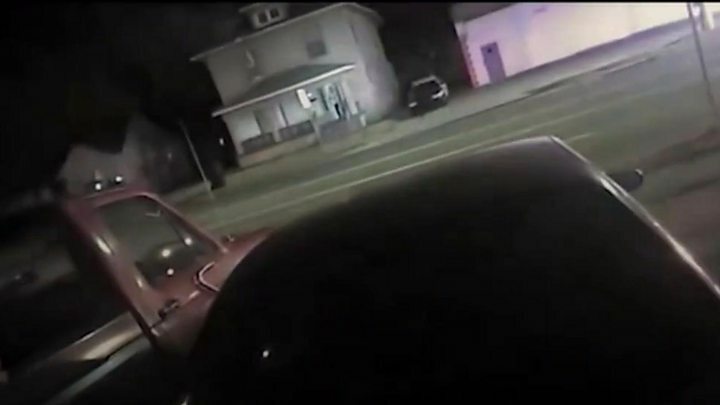 They said one round was released by officers after the 28-year-old failed to comply with verbal orders to keep his hands up, and appeared to move his hands toward his waist multiple times. Police say Mr Finch was later found to be unarmed, and was pronounced dead at a local hospital. A search found four of his family members inside, none of them dead, injured or taken hostage. His family told local media that he was not involved in online gaming. How many die in US police shootings? "The irresponsible actions of the prankster put people and lives at risk," said Wichita Police Department Deputy Chief Troy Livingston. "The incident was a nightmare for everyone involved, including the family and our police department. "Due to the actions of a prankster, we have an innocent victim. Had the false police call not been made, we would not have been there. "We don't see it as a joke, it's not a prank. It heightened the awareness of the officers, and we think it led to this deadly encounter." Image caption Wichita Police authorities confirmed the call was being treated as an alleged "swatting"
US media reports that a dispute over a game led to one gamer threatening another with a "swatting", who then gave the first gamer a fake address. That address was then reportedly given to a third person, a known online "swatter", who allegedly made the emergency calls. UMG Gaming, the online platform where the Call of Duty game was being played competitively for a small cash wager, released a statement saying they would work with the investigating authorities. Tyler Barriss, 25, was arrested by police in Los Angeles on Friday in relation to the investigation. Local reports say Mr Barris had previously been charged with making bomb threats to a local television station in 2015. Social media accounts reportedly linked to the incident have been suspended after a series of posts were made about the shooting.